Inbound means N cars going toward 4th and King. Outbound means N cars going toward Ocean Beach. N cars run in the subway under Market Street between Embarcadero and Church Street. N-Owl bus provides overnight and early weekend morning service. During weekday peak hours NX-Judah Express buses provide service along the corridor with stops on Judah west of 19th Ave and Downtown SF. Stops with a smaller dot are not wheelchair accessible. 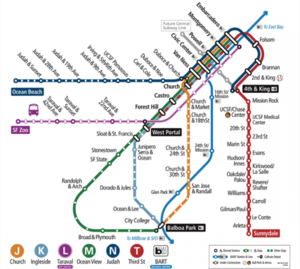 BART line and stations are in pink color. Caltrain line and stations are in green.